The weather has been amazing here of late. I believe Vernon told me in the past 40 days, we’ve received over three inches of rain and wet snow. That is simply, simply unbelievable. And it’s cold. I mean, in the 30’s and 40’s cold. With wind. I’ve been hiding out indoors. Sitting around. Now how I managed to NOT take a pic after I tarnished them… gah! 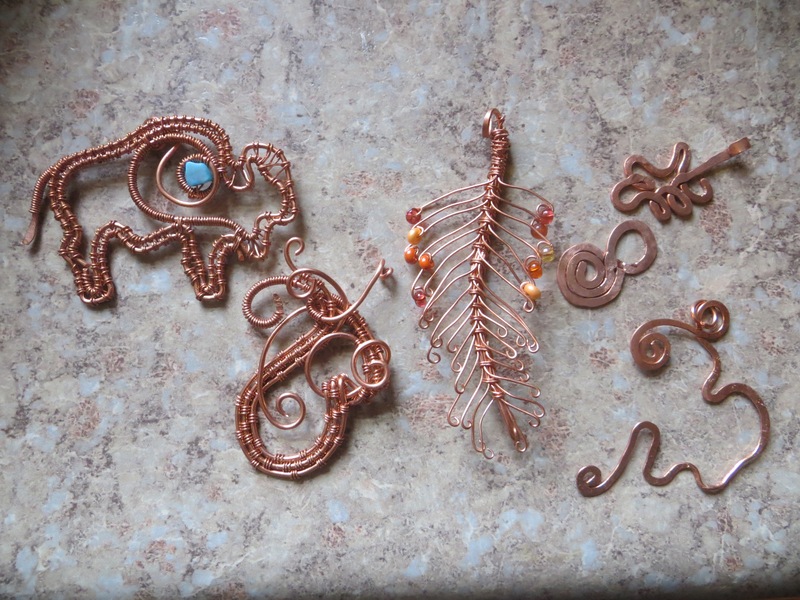 Plus, I made some more today… a butterfly, some straight earrings,and a tree of life pendant. All of which need photos… and then perhaps, they will be for sale. I don’t know if I’m good enough yet to make a product for sale, but it’s tempting! I would love one of the Buffalo pins….? Keep on crafting. Your good enough!!!!! Even better. I love those! You are certainly good enough to make things to sell! The feather is my favorite, but I really like all the more detailed pieces. You are very talented Carol. To ‘work’ and enjoy what you are doing is very special. Third from left intrigues me – is that a leaf? a centipede? Other things you make have been popular at community fundraisers, and I think you should include the copper work next time around. And you have several readers who would pay for those zentangled sneakers you have been doing for gifts. Go ahead and sell some stuff! I’ll pass the spirit of his message on to you. Some of us set very high standards for our work and are too critical of our work. I needed a little confidence boost to present my work. Consider yourself ‘boosted’, at least by me. You’ll never know until you present your work. Just be sure to price your work fairly for the materials, effort & creativity you put into a piece. p.s. What is the price of the Buffalo? I think it’s Great!